HomeOne Lovely Blog Award From . . . Monika Cornec. First of all, I apologize in the lateness of the acceptance of this award. I have never received this one and it brings a smile to my face, as do all of those who nominate me, each time I think about it. My blog being considered lovely by someone means a lot to me. It goes to show that no matter what one looks like or what one might be they may create something others find enjoyable, thus never consider anything you do to be not interesting or worthy of sharing. Someone will find it and connect with it. I never would have called my blog lovely. But I do like it. 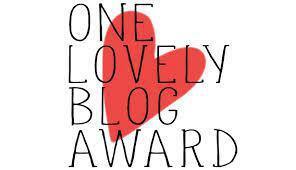 And now I have the One Lovely Blog Award courtesy of Monika Cornec of monimorphism. “I appreciate good writing and individual expression. That is why I follow your Blog. I may not agree with everything you post but I admire the “way” you present it.”-Monika Cornec’s About. There are a few guidelines that come with accepting this award. It’s 3:23 AM right now and I am still awake. Most of you know why. I once picked up a sharp object off the ocean floor at the beach and it turned out to be a sharks tooth. That was kind of cool. I have an about to be 10 year old son that can bat right and left handed. He did it naturally. Now he is trying to teach himself to pitch left handed as well. It’s going okay, but I stand well away from him. When I make a peanut butter sandwich I use creamy peanut butter and then put peanuts on it. It has a fresh taste to it and doesn’t have that chewy feeling like chunky peanut butter does. I can make homemade caramel and butterscotch sauce. And vanilla wafers too. I write poetry that makes people think I may be suicidal but I’m not. I have to let it out or I might turn that way. So no worries when you see the crazy poetry. It’s a good thing. 🙂 Just enjoy the insanity. There are so many others that I enjoy and find beautiful and have not listed here. I believe as I do come across you I will share this award with you. You know the reasons for this forgetful mind. Just know that many of you will be receiving this award. I love all of my Friends here in this community, and I appreciate each one of you, new and familiar. Again, thank you to Monika for this special award. It does make one feel lovely. Congrats on your award, Ronovan! Congrats Ronovan! Well deserved. Keep the crazy poetry going. Self expression is good! I want your caramel and butterscotch recipes, please. Thank you. I loved the photo you had. 🙂 And I am glad you liked because you made me notice that somehow you were not showing as someone I followed. So now I am following again. Congratulation on another award, Ronovan. Very well deserved. All the very best to you. I’ve been unable to blog as much as I’d like in the past week because I’m on holiday with my daughters and grandchildren, so I’m being mum and granny for most of the day, which I’m enjoying, although I can’t wait to go back to blogging and writing! Hope you’re having a good summer, too! That was me! I don’t know why it says anonymous!